September 22, 1862, President Abraham Lincoln issued the preliminary Emancipation Proclamation. This document was issued by Lincoln after the Battle of Antietam, threatening to free all slaves in the Confederate states if those states did not return to the Union by January 1, 1863. Legally, it was binding only in territory not under the control of Union forces. The original hand-written copy of this document has been part of the New York State Library’s collections since 1865. The library has published an online exhibit that visitors anywhere can access here. The online edition of the Atlantic Monthly features a transcript that visitors may access here. The Memory Project of the Library of Congress features an online site with copies of the first draft of the Emancipation Proclamation dated July 22, 1862, the preliminary version dated September 22, a photograph copy of the Emancipation Proclamation dated January 1, 1863, and a letter from President Lincoln to Albert G. Hodges, editor of the Frankfort, Kentucky Commonwealth, dated April 4, 1864. The Gilder Lehrman Institute of American History has just released Issue 21, September 2009 of its online journal History Now. "The story of the birth of our nation is a fascinating one—complex, surprising, difficult and triumphant. Although it is sometimes told in simplistic terms, this issue of History Now attempts to grapple with the ambiguities that define this critical moment in our past, and to offer thoughtful suggestions about how to teach the struggle for independence." The journal also features classroom materials for teachers. Click here to see more. A series of video clips for classroom use are also featured. The American Constitution includes a Bill of Rights comprising its first ten amendments. We call attention for the benefit of teachers, historians and students Bill of Rights Day celebrated each September 25th. It was on this day in 1789 that the Bill of Rights passed both houses of Congress. By December 15, 1791, the Bill of Rights had been ratified by three-fourths of the states, thus making the Bill of Rights the law of the land. Fundamental rights guarnteed under the state constitutions varied, and most Antifederalists appealed for greater legal protections of individual liberties. These included specific guarantees for jury trials, freedom of religion, prohibitions against cruel and unusual punishment, support for freedom of speech and freedom of the press. We call your attention to a number of online resources available for classroom and supplemental learning purposes. The Charters of Freedom maintained by the National Archives includes exhibits and educational materials about the Bill of Rights. In addition, Cornell University's Law School features an array of materials, including a transcript of the Constitution and Bill of Rights. A Hawaii-based online source called Know Yours Rights! 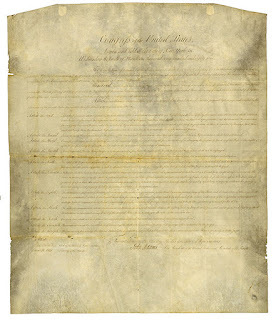 features a listing of the Bills of Rights found in each of the state's constitutions and more. It is said that as Benjamin Franklin observed delegates to the Constitutional Convention in Philadelphia come forward and sign the new American Constitution he noted a sun carved on the back of George Washington's chair. Said Franklin, "I have noted in the course of the session... looked at [the sun] behind the President without being able to tell whether it was rising or setting; but now at length I have the happiness to know that it is a rising and not a setting sun." 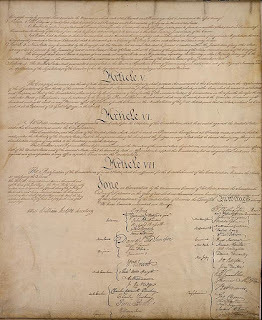 The signing and subsequent ratification of the U.S. Constitution represents a celebratory phase in the political experiment in self-government. On September 17, 1787 thirty-none men signed. James Madison was the convention's driving force. "There never was an assembly of men," said Madison, "charged with a great and arduous trust, who were more pure in their motives, or more exclusively and anxiously devoted to the object committed to them." The National Archives and Records Administration (NARA) celebrates this important day in our nation's history by presenting activities, lesson plans, and information. NARA encourages teachers and students at all levels to learn more about our Constitution and government. The National Constitution Center is located only steps away from Independence Hall in Philadelphia. It is also located on the Internet where teachers, students and constitutional scholars can access a variety of educational resources. ConstitutionFacts.com provides visitors to its web site with a series of education resources and Internet links "to help educators comply with the new federal regulation requiring the development of student programming to celebrate Constitution Day." We also highly recommend Annenberg Classroom, an ongoing project featuring an array of learning resources for teachers and students, including lesson plans, video resources, and multimedia materials in 14 different languages, all sponsored by the Annenberg Foundation Trust at Sunnylands. We also recommend Constitution Day materials provided by the Federal Court Educational Outreach, a project of the Federal Judiciary. Podcasts are a relatively new education tool a growing number of educational institutions are embracing. We're pleased to recommend podcasts courtesy of the American Constitution Society for law and Policy at Stanford University Law School, the We the People Stories from the National Constitution Center, and the Lewis & Clark Law School Podcasts. Finally, do you know where the first law school in the United States of America was founded? Many might be surprised to find it in Litchfield, Connecticut: the Litchfield Law School, founded by Tapping Reeve in 1784. It's buildings are preserved by the Litchfield Historical Society in northwestern Connecticut. For more information click here. For a list of the more than 1,100 graduates of this law school visit this link. You may also visit the History Place to read the text of the American Constitution. This evening the History Channel will be broadcasting its documentary 102 Minutes That Changed America. This web link features a timeline, actual radio broadcasts from September 11, 2001 and much more that will be useful to historians, teachers, students, indeed everyone. We also call your attention to a web site co-sponsored by the Museum of the City of New York and the Smithsonian National Museum of American History. Click here to learn more. The Library of Congress' Memory Project also features online resources. Staff at the Library of Congress issued a call within hours of the tragic events in New York City, Pennsylvania and at the Pentagon for original materials. You can see the online results of their work here. 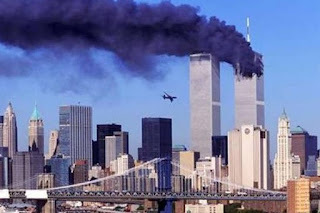 We also recommend the September 11 Digital Archive at this link. Finally, as we pause this day to remember those who lost their lives and honor those who made the ultimate sacrifice for liberty and freedom a visit to the Flags of Honor and Heroes web site. What should history organizations be doing to advance history education online? "Teaching information literacy, how to access materials online, search techniques, reading a site for reliability, and attribution. We want the student/non-professional person who approaches historical materials online to get engaged with them. This means putting as much as one's collection online as possible. Our users won't always be fascinated with those artifacts that fascinate us. By making as much of our collection available online as possible, we allow each user to explore and follows his interests." The Brumidi Corridors in the U.S. Capitol, Washington, D.C. The U. S. Capitol building in Washington, D.C., features priceless murals. Most noted among the murals are those by Constantino Brumidi. The History Education Council of Hawaii brings to the attention of Hawaii historians, students of all ages and interests as well as teachers that there are a number of online-based resources available. The Architect of the Capitol is an office established in 1793. Go to this link for its online text and images of the Brumidi Corridors. Links on this page connect online visitors with specific works. In addition, the frieze of the Rotunda of the United States Capitol contains a painted panorama depicting significant events in American history. Click here for a direct link as well as images. The Apotheosis of Washington in the eye of the Rotunda of the U.S. Capitol was painted in the true fresco technique by Constantino Brumidi in 1865. Click here for a direct link as well as images. The United States Capitol Historical Society also features an online tour of the Brumidi Corridors. The book Constantino Brumidi: Artist of the Capitol, Prepared under the Direction of the Architect of the Capitol, by Barbara A. Wolanin, Curator, is available for purchase from the U.S. Capitol Historical Society. A copy is also available for borrowing at the Hawaii State Public Library (759.13 Brumidi Wo) in downtown Honolulu. The National Council on Public History offers the Outstanding Public History Project Award to recognize excellence in work that contributes to a broader public reflection and appreciation of the past or that serves as a model of professional public history practice. The prize consists of $1,000 and a framed certificate presented at the NCPH Annual Meeting. Projects by individuals, groups, community organizations, businesses, or other organizations—or work done in support of such projects—may be nominated. The deadline for submissions is December 10, 2009. See the Outstanding Public History Award web page for more information and instructions on how to apply. See also the other awards offered by the NCPH. Jefferson: "History, by apprising them of the past..."
Did a South Carolina man discover evidence that could redraw Civil War maps? Host Elyse Luray goes to Columbia to investigate. Watch the full program on Monday, Sept. 7, 9PM. Go to this web link for the home page of the History Detectives Series. Enjoy!